Typically, an exam, x-rays, and a cleaning are all completed in one appointment. Patient exams are performed to determine existing and needed dental care. Exams often include the use of dental x-rays. Bitewing X-Rays: This type of x-ray is usually performed once a year at one of your 6-month cleaning/exam visits. These x-rays show us the back teeth only. Typically 1-2 are taken on each side of the mouth. Bitewing x-rays show both the upper and lower teeth and how they touch (occlude). They are used to check for decay in between the teeth. 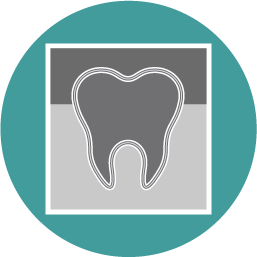 Without bitewing x-rays, dental decay in between the teeth is often not found until the decay is so large it causes pain and further extensive treatment is needed to restore the tooth. Periapical Film (PA): Usually a periapical film is taken when a patient is experiencing pain in a specific tooth. This provides an image of the entire tooth, crown to root tip. A periapical film can show an abscess, cyst, bone loss around a tooth, etc. This type of radiograph is crucial in diagnosis as it provides fine detail. Full Mouth Series: A full mouth series of x-rays is a combination of both bitewings and periapicals. This series includes 2-4 bitewing x-rays and no more than 14 periapical x-rays. Typically, this is taken every 5 years. A full series is taken to allow the dental professional a look inside the mouth to see things they would not otherwise. We can see the bone levels surrounding teeth. If a person suffers from periodontal disease, this helps us to see just how much bone has been lost around the teeth. We check for cysts, tumors, abscesses and other conditions and diseases. Panoramic X-Ray/Panorex: A panoramic film (also known as the Orthopantomograph) captures both jaws and teeth in one picture that takes about a minute to complete. The panorex will show the maxilla (upper jaw), the mandible (lower jaw), all the teeth including the "wisdom teeth," the frontal & maxillary sinuses, the nasal cavity and the temperomandibar joints (jaw joints). A panorex is useful in locating wisdom teeth, diagnosing jaw problems and planning orthodontic treatment. Cleanings involve the removal of plaque (soft, sticky biofilm) and calculus deposits that have built up on teeth over time. Plaque is unlike calculus; it is very soft and can be removed at home with our toothbrush. Calculus, on the other hand, is very hard, rough and rock-like, and must be removed by a dental professional. It is important to have this rough, rock-like material removed on a regular basis because bacteria grabs and holds much easier to surfaces that are rough, as opposed to smooth and slippery surfaces. The calculus deposits and bacteria that accumulate can irritate our gums, causing gingivitis, and can eventually lead to bone loss and periodontal disease. With that being said, not only do our teeth feel great after a professional dental cleaning, but it leaves the teeth smooth and clean, aiding you in the fight against bacteria at home!